Goodbye, Middle Class—Hello, Donald Trump? A study finding a drop in the percentage of Americans in the middle class has political elites anxious. The image of the United States as a broadly prosperous middle-class nation is a core tenet of American exceptionalism: the certainty that we provide for our citizens better than other countries, where a sclerotic class system stifles mobility. Last week’s Pew Research Center study on the decline of the middle class—its members no longer make up a majority of Americans; there’s now an equal share of us in the top and the bottom tiers combined—seemed to confirm the warnings about rising income inequality that are central to the campaigns of Bernie Sanders and Hillary Clinton. But the changes captured by the Pew study are doing more to buoy the campaign of Donald Trump, who is way ahead with Republican voters who didn’t go to college. These downwardly mobile Americans—folks without a college degree were most likely to fall out of the middle class, Pew found—are so far flocking to Trump, not Sanders, who draws most of his support from college graduates. There was a little bit of good news in the study that mostly got ignored: Almost twice as many people rose up and out of the middle class as fell downward into the lower tier. African Americans were among those gaining most ground, though they’re still disproportionately concentrated in the lower tier. And even if the share of people in the middle-class group fell, by 11 points, half the country is still there, while 29 percent are in the upper income tier, and 21 percent in the bottom tier. If more people are rising than falling, why did the study get so much attention? Literally hundreds of headlines blared its dark conclusions about middle-class shrinkage last week. I think there are three reasons. The most disturbing finding, to me, is not that the middle class shrunk as a percent of the country. It’s that the group lost even more wealth than it lost members. The share of Americans in the middle class dropped from 61 to 50 percent, but their share of wealth dropped more. In 1970, they had 62 percent of income. That dropped to 43 percent in 2014, while the share going to the upper tier rose from 29 percent to 49 percent. The Pew study also resonated because it’s long been believed that the myth—and by some measures, the reality—of the United States as largely a middle-class nation contributed to its political stability and dampened the appetite for radical politics, on either end of the political spectrum. And that leads to the third reason the study had an impact, breaking through the din of presidential campaign coverage: It seemed to help explain the rise of Donald Trump. 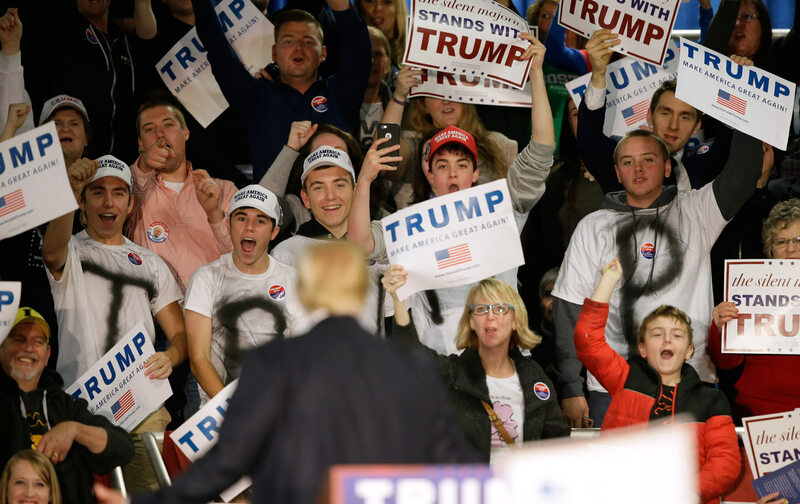 In the most recent ABC News/Washington Post poll, more than 40 percent of voters with only a high-school education support Trump, five times more than back Senators Ted Cruz or Marco Rubio. The creation of a relatively vast American middle class was partly a political judgment, in the wake of the Great Depression and World War II, that broader prosperity could thwart the appeal of fascism and communism. Elites made decisions to flatten inequality by investing in education and development, strengthening labor protections, subsidizing home mortgages, opening up new land by building roads and infrastructure, all financed by rising tax rates. Those benefits disproportionately went to white people, but all boats began to rise. The Pew study doesn’t talk about the public policy factors behind the decline of the middle class since 1970, but it’s clear that a GOP backlash and the rise of austerity politics played a role. On the one hand, it’s a good thing to shed the mythology and see the country’s economic stratification clearly. For a long time, more Americans have believed they were middle class than actually are—at both the top of the economic ladder, and at the bottom. The myth of the United States as a vast middle-class nation downplayed the numbers, and the struggles, of those left out. On the other hand, the appetite for radical politics inspired by this development may pull these folks not left but right, thanks to fear and xenophobia. Whether or not Trump is the GOP nominee, the Democratic Party will have a hard time winning the votes of whites who lack a college degree in 2016, or anytime soon. Still, despite all the coverage of the Trump campaign, we ought to remember that more Americans support Bernie Sanders—and many more back Clinton—than do Trump. Trump has the support of 27 percent of GOP voters in the latest NBC News/Washington Post poll, and GOP voters make up less than 50 percent of the electorate (it’s hard to say how much less because of variations in how pollsters count Republicans in primaries and general elections). So that means Trump has the support of at most 13 percent of American voters right now. With 37 percent of Democratic voters behind him, Bernie Sanders has the support of almost 20 percent of American voters—yet there’s a vast gulf in the coverage the two men are receiving. On the right, the Pew poll inspired concern at first, and provided a new excuse for Obama-bashing. “The middle class in America is declining and no longer constitutes a majority under President Barack Obama,” wrote the loons at Breitbart, even though the trends Pew identified long predate the current president. Now there’s a bit of a backlash, with National Review noticing the good news about the larger number of Americans moving into the top tier, and crowing about the overall rise in income share to every group (while not noticing, or caring, about the much larger share of income now going to the upper tier). Behind all the numbers, and the definitional quibbling, a few long-term trends are clear: Income inequality is higher in the United States than any wealthy nation; it’s growing; the gap between the top of the bottom is widening; and it’s dangerous. In a study released this month that got much less attention, the Forbes 400—America’s richest 400 individuals—hold more wealth than the entire African-American, or Latino, US populations. The New York Times found that 158 families have given half of all donations in the 2016 cycle so far. These issues will matter in the 2016 elections, whether Donald Trump makes it or not.